Welcome to Jewel’s Travel Adventures! Many of my friends love birds, so I thought it might be fun to share photos I took of bird artwork on the walls inside the tombs at Saqqara near Cairo, Egypt. When visiting these tombs, it is possible for tourists to purchase a camera permit allowing them to take photos inside. However, even with a camera permit, flash photography is prohibited, so it’s necessary to take either a camera that excels in low-light conditions, or a flashlight to illuminate the images while taking the pictures. The tomb of Irukaptah dates back to approximately 2400 BCE, making this tomb over 4,400 years old. It is also known as the Tomb of the Butchers because Irukaptah was the head of the butchers at the royal palace, and therefore his tomb contains some scenes on the walls inside that depict cattle being butchered. Just inside the entrance, there is a row of statues set into the wall. 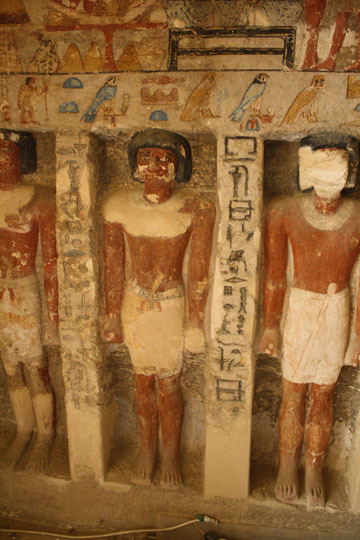 So far as I know, Irukaptah’s tomb is the only one at Saqqara that contains such statues. A row of birds sits on a panel just above the heads of the statues. Archaeologists estimate that the tomb of Ty was build circa 2494-2345 BCE, which would make it over 4,000 years old. 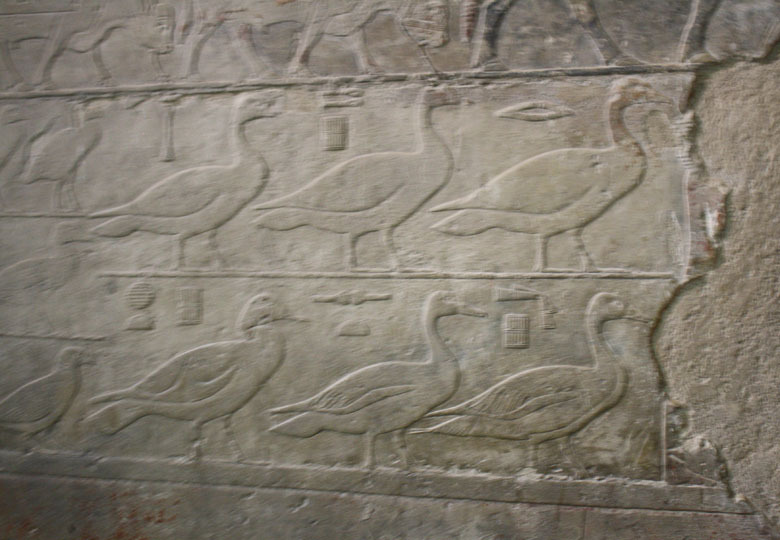 An entire wall inside the tomb of Ty is covered with images of birds. This is a wide angle view of the wall. If bird lovers have time to visit only one of the tombs at Saqqara, this one could be a good choice. 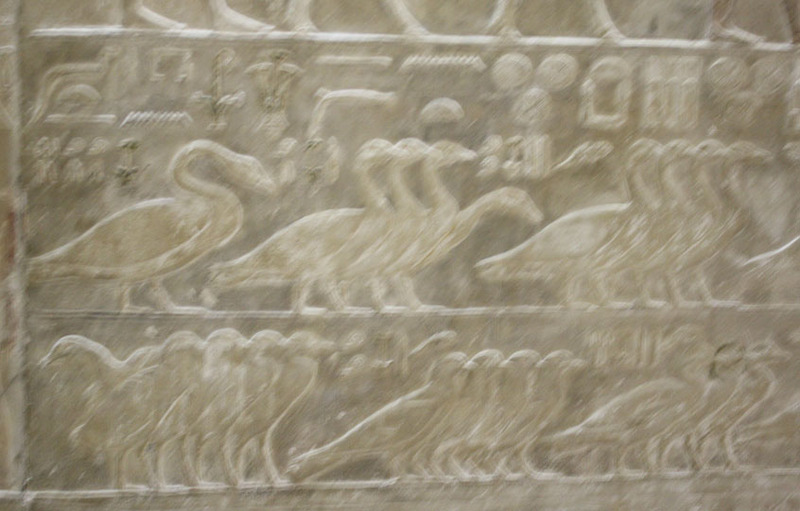 Here is a close-up showing the scene of the wading birds in the tomb of Ty in more detail. Ka-Gemni was the Pharaoh’s son-in-law, and therefore was able to afford an elaborate tomb. The sign on the entrance to the tomb says that it was built approximately 2340, making it over 4,000 years old. It is one of my favorites because it contains a scene on one of its walls showing a chorus line of dancers. But there is other art on its walls that’s also worth seeing. 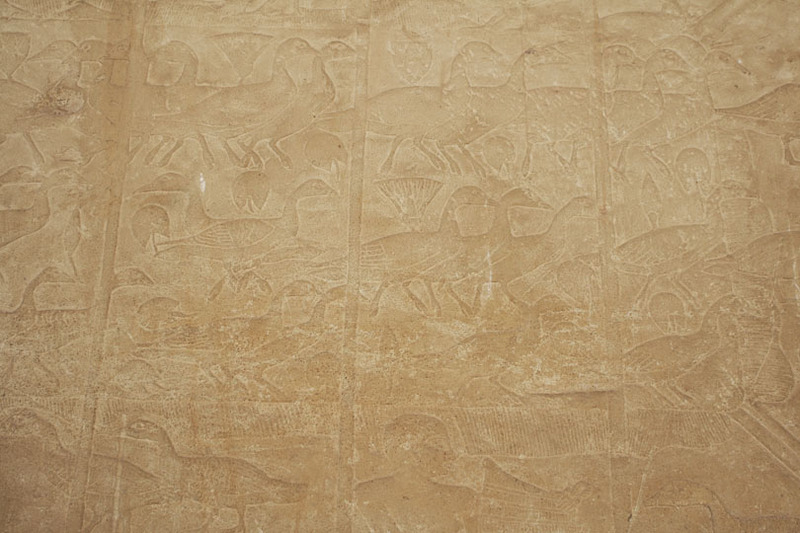 This beautiful marsh scene inside the tomb of Ka-Gemni shows several different types of birds. 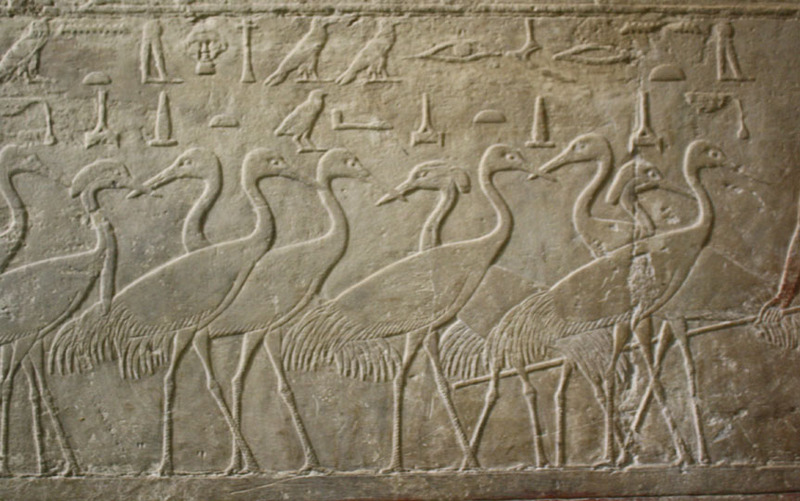 A scene inside the tomb of Ptahhotep shows several kinds of birds together. It was built approximately 2350 BCE, over 4,000 years ago. I hope to take another photo of this that’s better quality the next time I go to Egypt. 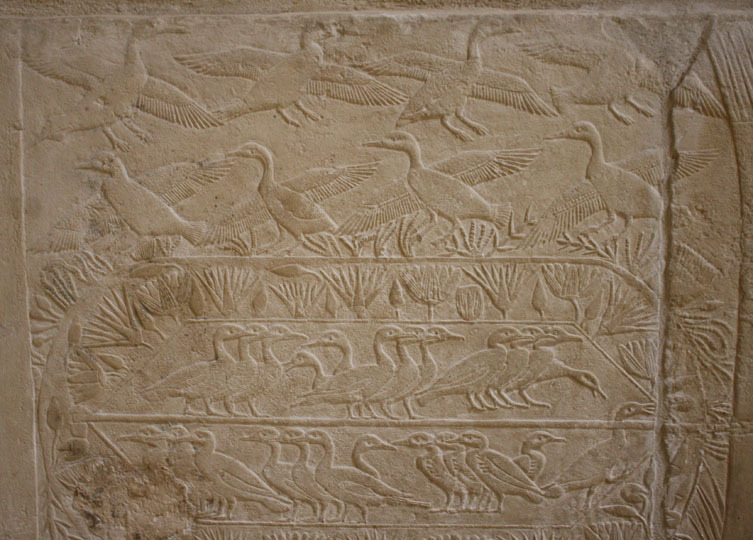 These are the only photos I’ve taken so far of birds on the tomb walls of Saqqara, but I hope to return in the future and take more! I have visited the necropolis at Saqqara about 5 times. It’s always a pleasure to go back, because every time I go, I see something new. Even when I return to tombs I’ve seen before, I’ll often notice something that I missed on previous visits. Also, only some of the tombs at Saqqara are open for the public to go inside. On my trips to Egypt in February 2017 and April 2018, I engaged a guide to take me inside every tomb that was open at the time. However, occasionally, Egypt will open another to attract tourists, so there’s often something new to see. For example, in September 2018 Egypt announced it would open the tomb of Mehu to the public for the first time, and I look forward to visiting it and seeing its magnificent art for the first time! I’ve heard there are images of dancers inside!